Continuing a tradition started at the inaugural Equestricon racing convention, fan festival and trade show, organizers for the event announced Friday that the team behind Justify will celebrate his historic Triple Crown run with attendees at Equestricon. 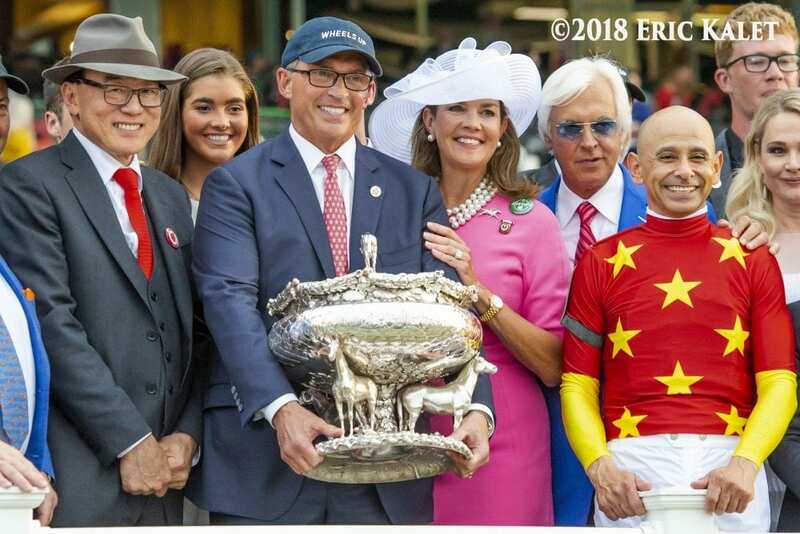 In a press conference today, WinStar farm revealed it will bring trophies from Justify's Triple Crown campaign to the convention on Tuesday, October 30, and participate in an autograph signing expected to feature the horse's owners, jockey Mike Smith and trainer Bob Baffert. Proceeds from the autograph signing will benefit the Permanently Disabled Jockeys Fund (PDJF). Equestricon will serve as the anchor event for the Breeders' Cup Festival in Louisville this year, beginning Monday, October 29, at the Kentucky International Convention Center (KICC). In addition to the Justify trophy exhibit, photo opportunity, and autograph signing for the PDJF on the second day of the convention, Equestricon will also feature Breeders' Cup trophy photo opportunities, along with dozens of leading jockeys, trainers and other major racing personalities who'll be available during signings, meet-and-greets, workshops and panels. At the inaugural Equestricon, attendees were treated to the opportunity to take their photo with the Kentucky Derby trophy of Always Dreaming, along with an autograph signing benefitting PDJF. This year, the ownership team behind Justify includes WinStar Farm, Starlight Racing, China Horse Club and Sol Kumin's Head of Plains Partners. WinStar and Starlight are returning participants in Equestricon, with Starlight having sponsored the convention last year and WinStar a part of the popular “Horse Country Row” installation featuring prominent Kentucky farms. This entry was posted in NL List, Triple Crown and tagged Bob Baffert, elliott walden, Equestricon, Justify, mike smith, Triple Crown, winstar farm by Edited Press Release. Bookmark the permalink.